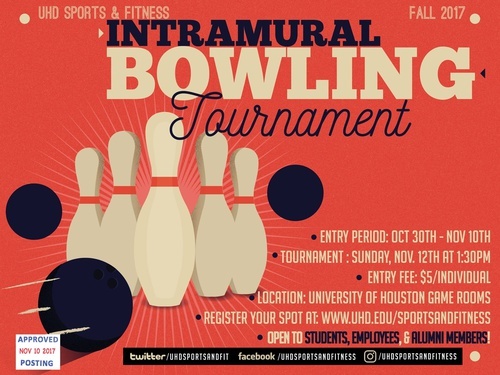 University of Houston-Downtown (UHD) Sports & Fitness will host its Intramural Bowling Tournament at 1:30 p.m. on Sunday, Nov. 12 in the University of Houston (Main) Game Rooms. The one-day tournament will include three separate divisions: Men's Competitive, Women's Competitive and "Just for Fun", and is open to current UHD students, faculty, staff and Sports & Fitness Alumni members. The entry fee is $5 per person and includes three rounds of bowling and fun. To reserve your spot in the tournament, you must submit the registration form and $5 entry fee to the Student Life Center by 7 p.m. on Friday, Nov. 10. All tournament participants will receive an exclusive 2017-18 Sports & Fitness "Darth Gator" t-shirt.